Listen to a recording of the press event. 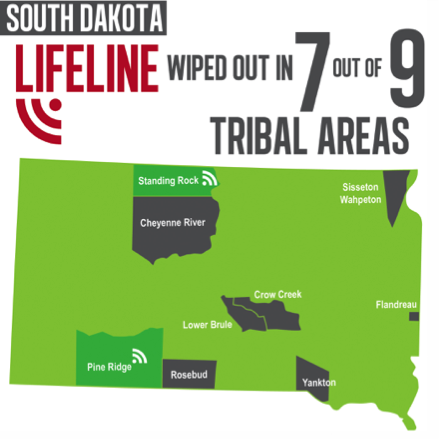 WASHINGTON, D.C.—In an urgent warning issued less than 48 hours before the Federal Communications Commission (FCC) is scheduled to act, three major voices—Consumer Action, the former Chairman of the Oglala Sioux Tribe Utility Commission and the rural-focused National Grange—warned that FCC Chairman Ajit Pai’s attack on the Lifeline program would kill wireless service for most Tribal lands in the U.S. immediately and then for millions of other Americans in the following months. FCC Chairman Pai will ask other commissioners to vote Thursday (Nov. 16) on an overhaul of Lifeline, which provides phones and broadband services for low-income Americans. Even though the program currently serves less than a third of eligible US households, Chairman Pai is seeking to further shrink the amount of available funds for Lifeline. Pai also wants to ban four of the five largest wireless Lifeline providers that currently serve the vast majority of people in the program. Several groups are concerned that the Pai “reforms” are a deliberate effort to kill off Lifeline, leaving no viable alternative for the veterans, senior citizens, disabled, and struggling low-income families that depend on the program for medical care, employment prospects, emergency services, and bridging the homework gap. MEDIA CONTACT: Alex Frank, 703-276-3264 or [email protected]. EDITOR’S NOTE: Click here for a streaming audio replay of the news event is available here.